Date-Sweetened Dark Chocolate Coconut Macaroons for an easy no-bake dessert! Ah, summer. The time of the no-bake desserts, treats, snacks and anything to make us not to have to turn on our ovens in the heat. I’m excited to share these Date-Sweetened Dark Chocolate Coconut Macaroons with you guys today. You will absolutely love these super simple and delicious macaroons that are my current favorite snack or mid-afternoon sweet treat. And the best part? They are only sweetened with dates. They add the perfect amount of sweetness and deliciousness to these easy macaroons. My other absolute favorite part is that they have an extra nutritional boost in them thanks to Manitoba Harvest Hemp Heart Toppers. 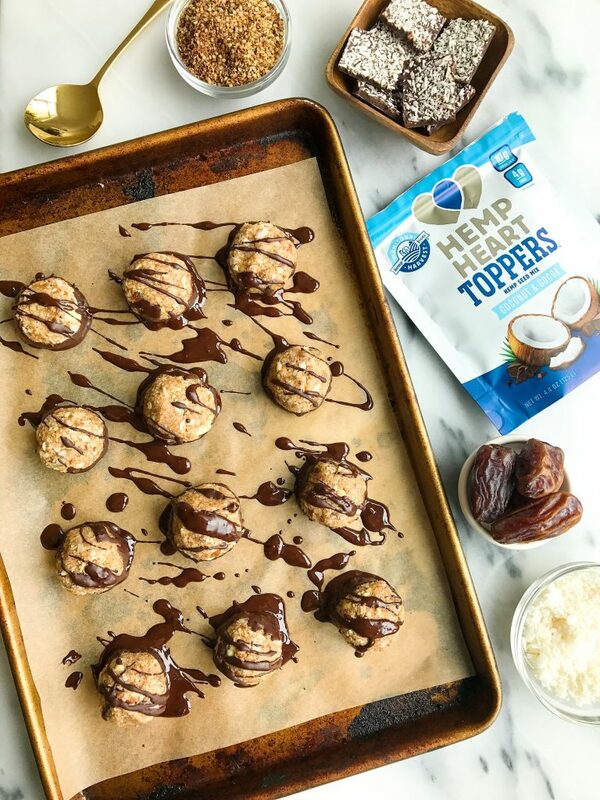 I used their Coconut + Cocoa flavored hemp hearts for these to add some extra coconut-y and chocolate-y flavor we crave. You can add their unflavored hemp hearts as well, either work! I have been using Manitoba Harvest Hemp Hearts for a variety of recipes and random eats and drinks during the day. I add them to my smoothies, on top of salads, popcorn, cookies, anything! They give me extra 10 grams of protein and omega-3 and omega-6 per 35-gram serving. And help make the recipe a bit more filling and nutritious. 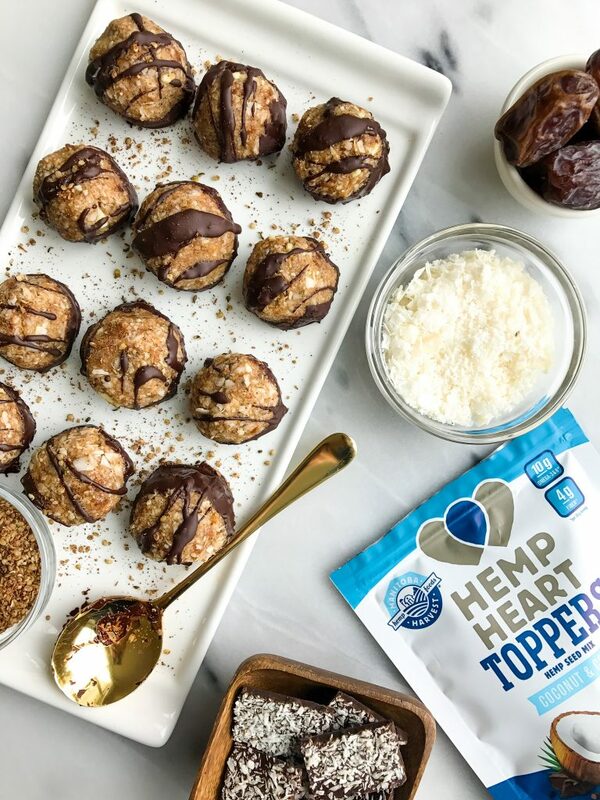 Their Hemp Heart Toppers come in four different flavors both sweet and savory. Coconut + Cocoa, Maple + Cinnamon, Chipotle Garlic + Onion and Onion Garlic and Rosemary. 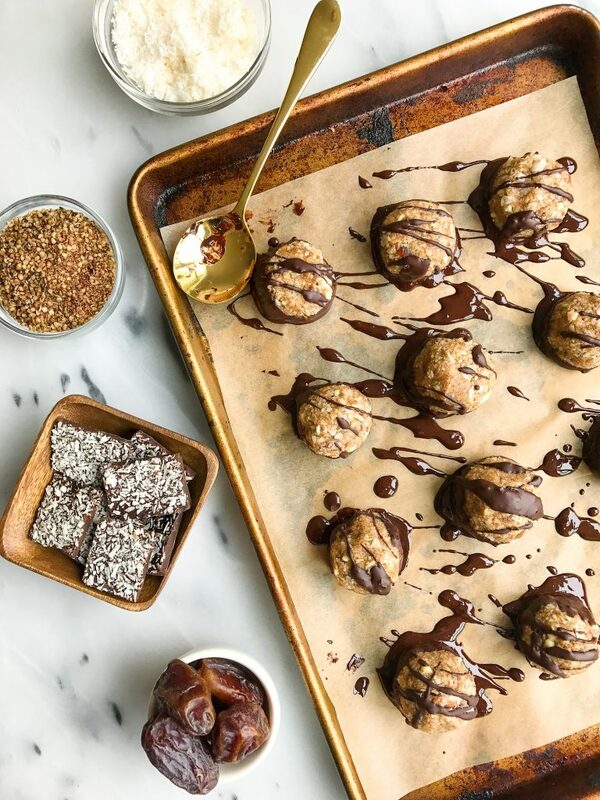 These Date-Sweetened Dark Chocolate Coconut Macaroons will officially rock your world. Ok maybe no rock but like I hope you love them as much as I do! Drizzle remaining chocolate on top and add back to freezer for another 30 minutes then enjoy! Thank you Manitoba Harvest for sponsoring this post. It means so much to me to work with brands that I love and who support rachLmansfield! Mmm… dark chocolate and coconut is a really good combo. Macaroons are one of my favorite little treats! Those hemp heart toppers sound amazing! I have been on a search for them lately! Can you use a blender if you don’t have a food processor?